Plan to attend the community workshop on the redevelopment of Potomac Yard. View a three-dimensional model and other media that present the current plan proposed to promote the long-term vision for the Potomac Yard retail center. Meet PYPAG members and City staff, and provide comments and ask questions on the proposed plan. Participate in focused briefings and discussions on: site design and sustainability, transportation, and open space, civic uses, and housing. 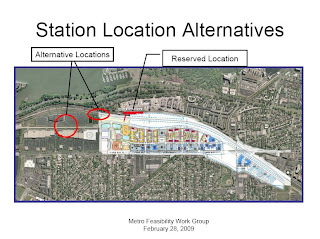 Comments received at the community workshop will inform the final drafting of the Potomac Yard Master Plan, to be released to the public in early December 2009, in anticipation of being heard by the Planning Commission and City Council on the February 2010 dockets. Could the railroad come back to Arlandria?